Oregon Bengal Rescue View other Bengals for adoption. 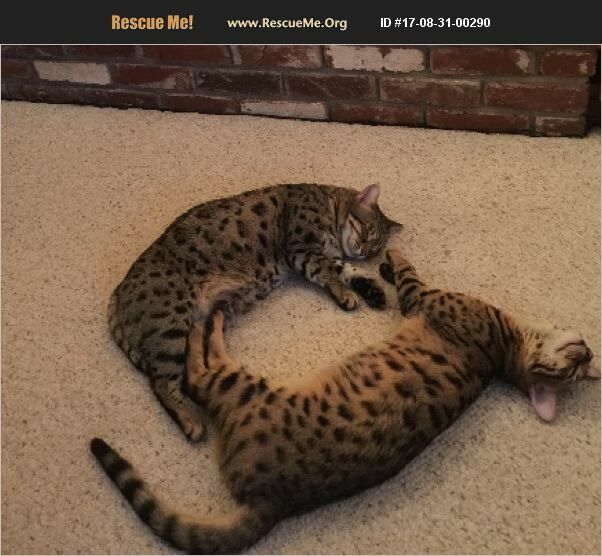 We have two beautiful female bengal cats that due to changing circumstances we MIGHT need to re home. We adore these girls. They are extremely loved and well cared for. Luna is just a little over one year and Moonlight is 5. Neither have health issues or behavior issues. They are indoor only girls and eat raw chicken (cut up game hens, chicken liver and hearts with a vitamin mixture) they will NOT eat store bought cat food. It is a must that they be re homed together to a special person or family who will agree to continue their raw chicken diet and never de claw them. They both love to play with toys. They race through the house in games of chase or simply with a fluffy ball in their mouths. Moonlight has picked me (female) to snuggle with on her terms of course. On occasion Moonlight will sit with other members of the family. Luna just wants to play, no snuggling but likes to be petted. When Luna sees my son she will meow at him and run to a string toy, her way of asking him to play. Moonlight can be very vocal maybe once or twice a day if she has a toy and wants you to know about it. She will meow LOUDLY for about ten times and then be done. Luna is a cabinet dweller. She opens them and pops in and out or takes a nap. Our hunting dogs are away at training and I am hoping that after extensive obedience training we can all live harmoniously but their prey drive just might prove too strong and I couldn't live with myself if the girls could no longer safely chase and play the way they are used to. I'm putting this out in advance to see if there could potentially be a good match if things don't work out some time in OCTOBER. Also, it might help heal my broken heart knowing someone will love and care for them as much as we do.